Huaxia Mingwang Review 2019: Is Huaxia Mingwang a Good Hosting? Huaxia Mingwang is a well established Chinese hosting provider. While it doesn’t stand out in one specific area, it’s a good all around host at a reasonable price point. Huaxia Mingwang has been providing Chinese hosting services since 2002. Its tens of thousands of customers come from 31 provinces, cities, and regions across China including Hong Kong, Macao, and Taiwan, as well as Europe, the U.S., and Russia. The website is provided in Chinese. There’s quite a lot of choice when it comes to the shared hosting plans. First, you can choose between Windows 2003, 2008, or 2012, and Linux operating systems. Second, if you select one of the “Overseas” plans, you can choose to host your data on Hong Kong or Silicon Valley based servers. Both the Linux and Windows plans support PHP versions 5 through 7, while the Windows plan also supports ASP and ASP.NET. There’s FTP access and you can schedule specific tasks to run on your website. For ease of use, there is a one-click installer for 300 programs including WordPress, Joomla!, and Drupal, as well as a custom home page to get you started. There’s plenty of security features which come as standard with the virtual hosting plans e.g., protection against attacks and hackers, a specified directory to quarantine and clean up Trojans, and offsite backup and management. The prices listed are in Chinese Yuan and for one year. Given the level of resources and features, the plans are reasonably priced. Take note that you’ll still need to buy an SSL certificate and domain name on top of the hosting plan. However, unlike lots of companies, Huaxia Mingwang does not overwhelm you with masses of add-ons in the checkout flow. You can purchase plans in one, two, three, five, or ten year increments. Unusually, whatever term you opt for (except for ten years, in which you need to send the full amount of money) you only pay for one year upfront and there’s no reduction in price. I was impressed with the customer service. As well as having a large help center (although there was a problem with the search function when I visited), you can contact the team by phone, email, and live chat 24/7. I have chatted with them on live chat in English and as you can see from the time stamp on the screenshot, the operator responded straight away. 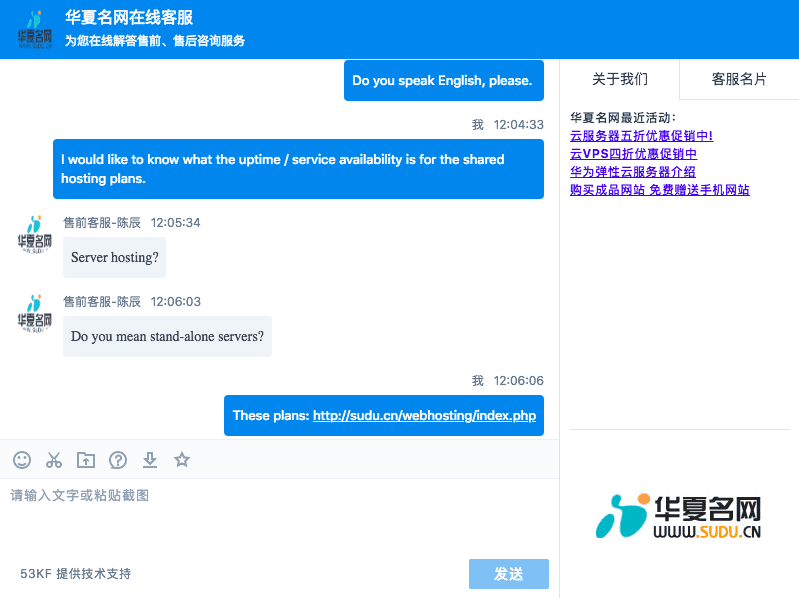 The operator advised they did not have perfect English and could not answer all of my questions – of course, not a problem for Chinese customers. Huaxia Mingwang has more than 500,000 customers, with a 90% renewal rate. Its shared hosting plans are simple, not necessarily outstanding in any area, but offering a good level of resources for a fair price, with excellent customer service. Wondering how Huaxia Mingwang stacks up against other Web Hosting companies? Enter any other Web Hosting company and we will give you a side-by-side comparison.